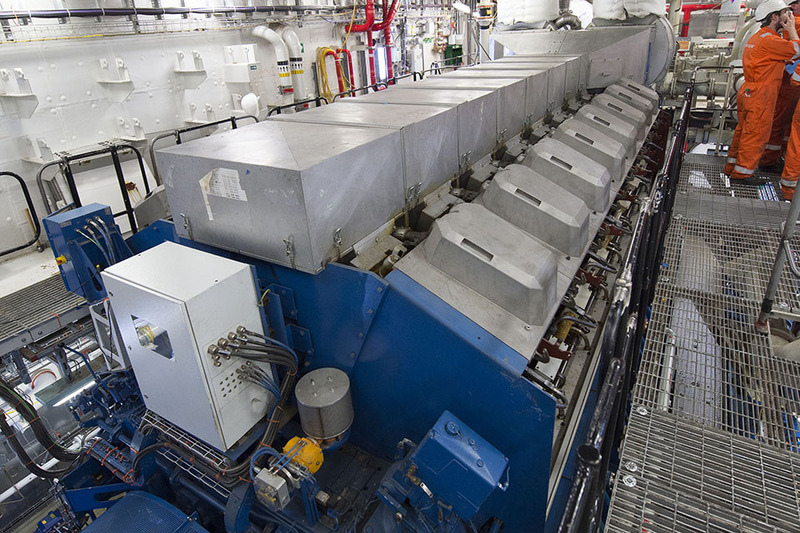 The 65,000-tonne future flagship of the Royal Navy has undergone months of preparation work by the Aircraft Carrier Alliance (ACA) to start the first of her four diesel engines, which are directly coupled to the generators. Together, each power unit weighs approximately 200 tonnes – the weight of two medium size passenger jets. Minister of State for Defence Procurement, Philip Dunne, officially started the first of the ship’s four diesel generators at the home of the UK’s aircraft carrier programme in Rosyth, Scotland on June 25, bringing the ship to life for the first time. He also announced that BAE Systems has been awarded a £5.5 million contract to install a new Vessel Traffic Management System (VTMS) to assist in the controlling and monitoring of all ship movements within Portsmouth Harbour and the Eastern Solent to prepare for the arrival of the carrier, around the end of 2016, beginning of 2017. Mr. Dunne said: «It is a real pleasure to be back in Scotland, home of the UK’s shipbuilding industry, to witness the impressive progress that is being made on our new aircraft carriers. Powering up the diesel generator today marks an important milestone on the journey to bring these highly versatile ships into service with our Armed Forces. They will be the largest, most capable and effective surface warships ever constructed in the United Kingdom. The build programme is supporting thousands of jobs across the country, with over 4,000 of those jobs at Rosyth and the Clyde». 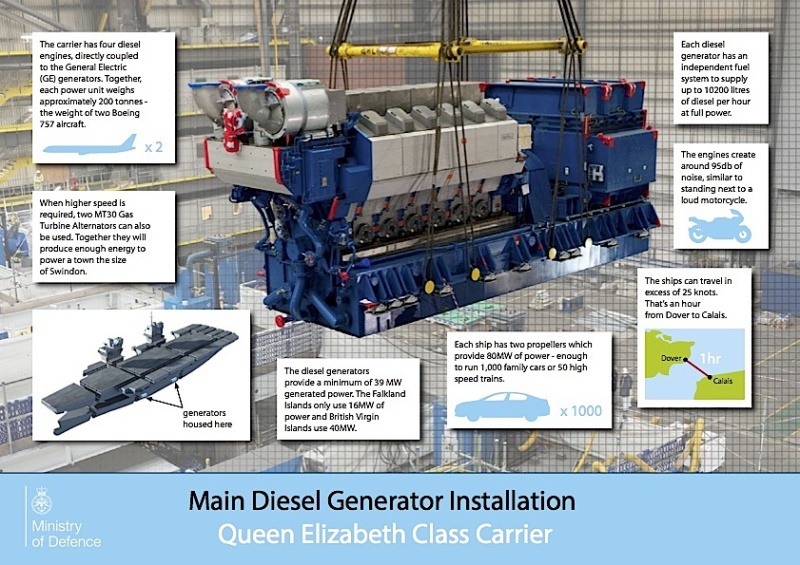 The diesel generator sets will provide sufficient electrical power to drive the ship at cruise speeds (25 knots/29 mph/46.3 km/h), but when higher speed is required, two Gas Turbine Alternators will also be used. Together they will produce 109 MW of power, enough to power a medium-sized town. Rear Admiral Henry Parker, DE&S Director of Ship Acquisition, said: «Every milestone achieved on HMS Queen Elizabeth brings us a step closer to her becoming an operational warship. A great deal of hard work has taken place to bring us to this stage and, with good progress also being made on HMS Prince Of Wales, we are moving ever closer towards these magnificent ships joining the Fleet and becoming the centerpiece of Britain’s future military capability». To the end of May 2015, the Ministry of Defence had paid around £3.12 billion to BAE Systems on the Clyde (c. £1.925 billion) and to Babcock at Rosyth (c £1.194 billion) on the Queen Elizabeth Carrier (QEC) programme. Our estimates for the level of remaining work in Scottish yards are currently being updated. QEC work is estimated to support directly some 4,000 jobs and hundreds of apprentices at the Rosyth and Clyde-based shipyards. 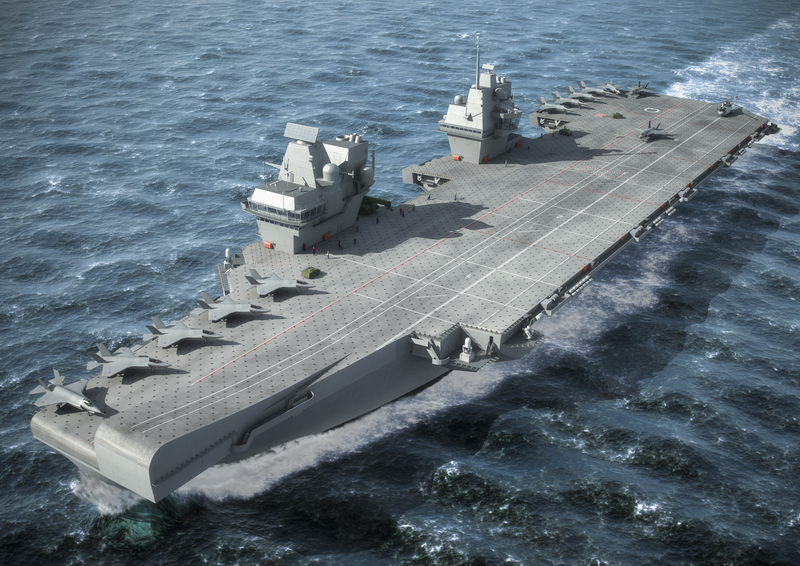 The VTMS contract is the latest development in the partnering agreement between BAE Systems, the Royal Navy and Ministry of Defence (MoD) to modernise HM Naval Base Portsmouth and prepare for the arrival of HMS Queen Elizabeth (R08). The new system installation, which is to be completed early 2016, is designed to provide the Queen’s Harbour Master and the Vessel Traffic Service team with the situational awareness they require to control the vessels in their operational area. 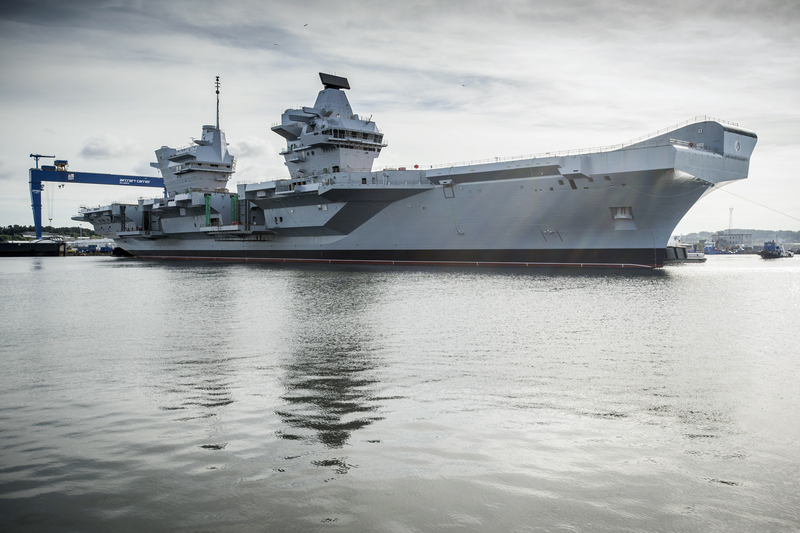 Following sea trials (from 2017) and First of Class Flying Trials for helicopters and the F-35B Lightning II (starting in 2018), HMS Queen Elizabeth (R08) will undertake a coherent build up towards achieving an Initial Carrier Strike Capability in 2020. Second of class HMS Prince Of Wales (R09) is now almost half-complete at 30,000 tonnes, the forward island was installed in May 2015 forming the iconic carrier shape of the vessel. 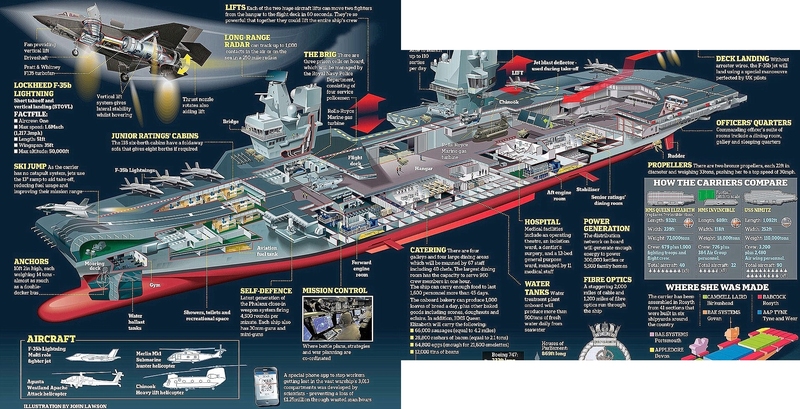 Initial Operating Capability (IOC) of HMS Prince Of Wales (R09) is expected in 2023. The aircraft carriers HMS Queen Elizabeth (R08) and HMS Prince Of Wales (R09) are being delivered by the Aircraft Carrier Alliance, a unique partnering relationship between BAE Systems, Thales UK, Babcock and the Ministry of Defence.